Who Owns Your Safe Material Handling System? If the answer is “corporate,” or “the safety department,” chances are that any success you have is marginal – and temporary – at best. Peggy, the safety manager for a global automobile manufacturer, says, “If corporate owns it, it’s not sustainable. A safe material handling system must be owned at the operations level.”Peggy knows what she’s talking about. 3 years ago, she empowered her operational staff to take on a ‘train-the-trainer’ approach to safe material handling. The results? 1 lifting-related injury at her local plant in the past 6 months. Prior to implementing the safe material handling system, lifting-related injuries were happening several times a week. Safe material handling – and safety itself – are personal to each of us. What seems like a simple twist of the torso can result in chronic back pain, with lifelong impact. The effects are far-reaching: chronic pain, a life of limitations, depression. Which then leads to damaged relationships, and damaged lives. No one ever goes to work intending to be injured. Period. Your employees know that their security and safety is at stake. Place the safe material handling system in their hands. Allow them to take ownership of it. So what does it mean to ‘train-the-trainer?’ It means giving your employees the training. And then having them train their co-workers. To foster ownership of your company’s safe material handling training systems, create trainers among peers and local team leadership and management. These individuals become, in a sense, ambassadors of the safety system. Make sure these individuals are recognizable as ambassadors for safety. In day-to-day operations, these men and women are your coaches for others on the line. They are also the classroom trainers for the more formal aspects of the trainings. These individuals are also trained as mentors and coaches. They can – and will – provide feedback, and review what does and doesn’t work, as they observe their peers and work alongside them. They will notice when their peers are using safe lifting techniques and provide acknowledgment and compliments to reinforce safe material handling. Notice that the system is incentive-driven, rather than punitive in nature. The best news is that the consequences of poor lifting techniques – injury – are greatly mitigated. PowerLift offers companies the ability to have their own safe material handling system trainers on sight every day. Having your own personal safety trainers on scene ensures that training will last far beyond the initial training. We also provide new PowerLift trainers with a library of over 1,200 one-page Safety Talks for continued learning. We know that the one-and-done training programs don’t work and that’s why ongoing training is absolutely necessary in order to eliminate strains and sprains at your company. When the trainers are your own your company owns the safe material handling system. 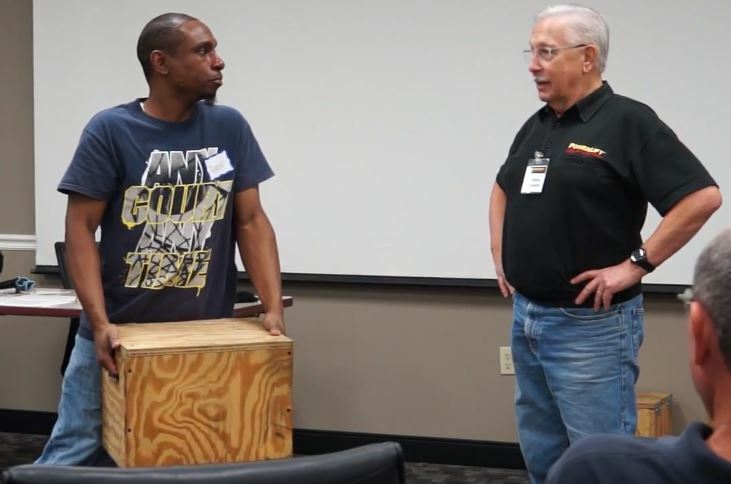 Contact us today to learn more about how PowerLift back safety training can improve your businesses safety today!